If God is most glorified in us when we are most satisfied in him, as we argued in Chapter 2, then living for the glory of God must mean that we live to gladly make others glad in God. Our gladness and our pursuit of their gladness glorifies God. And since gladness in God is the greatest and most lasting happiness, pursuing it is also love. Since the same joy in God both satisfies man and glorifies God, we never have to choose between the motive to love people or to glorify God. 4 By gladly pursuing the gladness of others in God—even at the cost of our lives—we love them and honor God. This is the opposite of a wasted life. To make others glad in God with an everlasting gladness, our lives must show that he is more precious than life. “Because your steadfast love is better than life, my lips will praise you” (Psalm 63:3). To do this we must make sacrificial life choices rooted in the assurance that magnifying Christ through generosity and mercy is more satisfying than selfishness. If we walk away from risk to keep ourselves safe and solvent, we will waste our lives. If Christ is an all-satisfying treasure and promises to provide all our needs, even through famine and nakedness, then to live as though we had all the same values as the world would betray him. I have in mind mainly how we use our money and how we feel about our possessions. I hear the haunting words of Jesus, “Do not be anxious, saying, ‘What shall we eat?’ or ‘What shall we drink?’ or ‘What shall we wear?’ For the Gentiles seek after all these things” (Matthew 6:31-32). In other words, if we look like our lives are devoted to getting and maintaining things, we will look like the world, and that will not make Christ look great. He will look like a religious side-interest that may be useful for escaping hell in the end, but doesn’t make much difference in what we live for and love here. He will not look like an all-satisfying treasure. And that will not make others glad in God. If we want to make people glad in God, our lives must look as if God, not possessions, is our joy. Our lives must look as if we use our possessions to make people glad in God—especially the most needy. 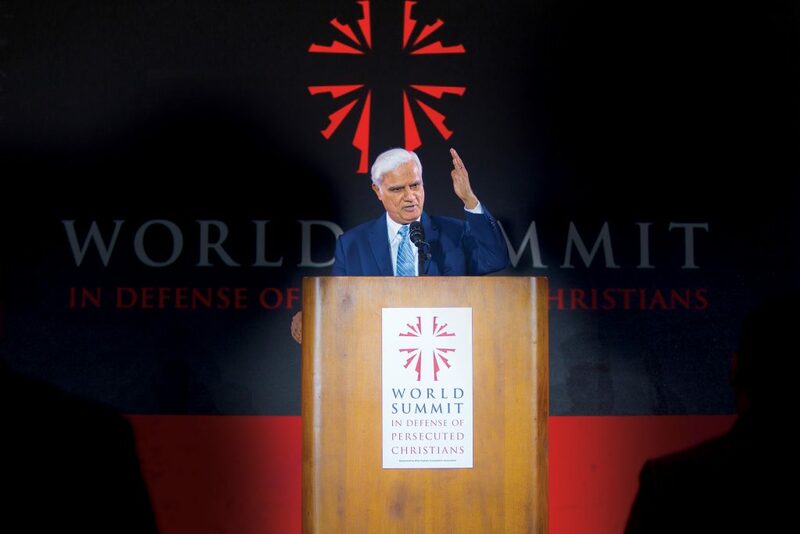 Christian apologist and author Ravi Zacharias spoke at the World Summit in Defense of Persecuted Christians last May in Washington, D.C. He argues there is danger in the death of absolutes in today’s digital age. I have so many questions—and a few doubts—about the Christian faith. What should I do with them? You are doing precisely what you need to do—you’re being honest with yourself and open with your questions. That’s the first step toward finding answers. If you do the opposite—bottling up your concerns in the hopes they’ll go away—then they’ll just fester and infect your entire spiritual life. Instead, let me urge you to follow the wisdom of Scripture. Jesus said, “Everyone who asks receives; the one who seeks finds; and to the one who knocks, the door will be opened” (Matt. 7:8). This echoes a principle in the Old Testament: “You will seek me and find me when you seek me with all your heart” (Jer. 29:13). I’ve struggled with spiritual questions for most of my life, and in some ways I still do. It’s an ongoing process to find answers that satisfy my heart and soul. But even bouts of doubt can show we’re thinking and growing, rather than simply clinging to what we’ve been told. As I described in The Case for Christ, my greatest season of spiritual introspection came after my wife, Leslie, announced that she had become a Christian. That was hard news for a skeptical journalist to hear! But it set in motion my own journey of asking tough questions—and discovering unexpected answers. In the end, I concluded that it would take more faith for me to maintain my atheism than it would to become a Christian! After almost two years of searching, I got on my knees and asked Jesus to forgive my sins and lead my life. It was a decision that changed everything; in fact, it was the pivotal moment of my life. That decision, mixed with the research I did then and in the time since then, led me to a sense of confidence that there are satisfying answers to even our hardest questions. It’s in that spirit that I write this book. Jesus stayed behind . . . sitting among the teachers, listening to them and asking them questions. Everyone who heard him was amazed at his understanding and his answers.